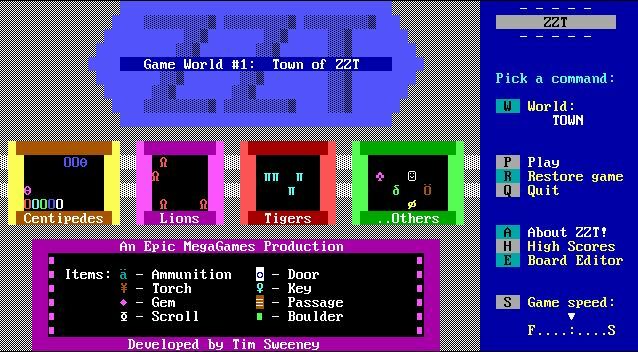 In 1991, Epic MegaGames released ZZT into the world as shareware. The game’s graphics were comprised of ANSI characters (aka, letters on the keyboard). But beyond the initial free game there was something even more exciting – game creation software. Players could create their own worlds, and therefore, their own games by simply owning a copy of ZZT. The titles born of this software, as well as the software itself, inspired an entire generation of people. 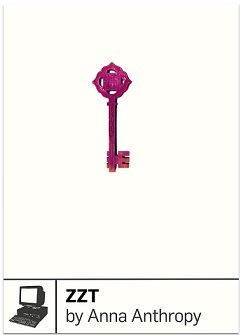 One who found her life changed was Anna Anthropy, who has just released a book on ZZT thanks to publisher Boss Fight Books. Anna’s deep adoration for ZZT is palpable from the very start. At first, she discusses the basics of the software while also diving into memories of having discovered and played it. The writing is skillful enough to weave both historical and personal moments together, giving the reader a clear vision of ZZT but also Anna’s relationship with it. It’s simply fantastic getting an almost “first hand” experience through reading the book. Another thing that Anna clearly demonstrates is an incredible ability to break concepts of game creation down into something that non-developers can understand. Part of this seems due to the inherent ease of coding in ZZT, but part of it is also due to impressive description by Anna. Explanations never feel too complex or out of reach. Instead, they make one feel as if they should snag a copy of ZZT and start messing around. Considering the program is still available for free today this proves an easy itch to scratch. Of course, the ZZT scene is also discussed at length. In the 90s there were tons of teenagers and adults sharing their creations online. Some of these games are discussed in the text, although there are so many more out there. What one discerns while reading about these games is how personal they were – something that is definitely missing in the “AAA” gaming scene. Reading through ZZT was such a joy. I say that as someone who had only the vaguest knowledge about it before reading. Although I had never touched the program, never played a game designed with it, or anything of the sort, I couldn’t help but keep reading. Anna is simply a tremendous writer who kept my attention throughout. If the book had been double the size I would have happily read it! As is, you get a great taste for ZZT for nearly 150 pages but it serves mostly as a tease. Afterwards, it’s hard to keep from visiting ZZT.org and trying out a few games yourself. Those who do have fond memories of the ZZT days will no doubt love this book even more. It includes a great deal of interviews with prominent names of the time. I can’t even imagine how difficult it might have been to connect with some of these individuals after dozens of years, but Anna’s efforts produced a marvelous result. Everyone with an interest in the history of computer games needs to check out ZZT by Anna Anthropy. The writing manages to cement its historical importance without ever becoming dull. By sidestepping this pitfall, readers are able to become fully engrossed in each page. ZZT’s existence deserves to be remembered and commemorated and Anna Anthropy has penned the perfect book to do exactly that. If you would like to see more of her work, I highly suggest reading Rise of the Videogame Zinesters and Star Wench or simply checking out some of her games!